Adorable, cult classic, drumming action will arrive on November 2, 2018 with Taiko no Tatsujin: Drum Session. While plenty of players may be familiar with the series, this is the first time it is being released on the PlayStation 4 in the United States and Europe. 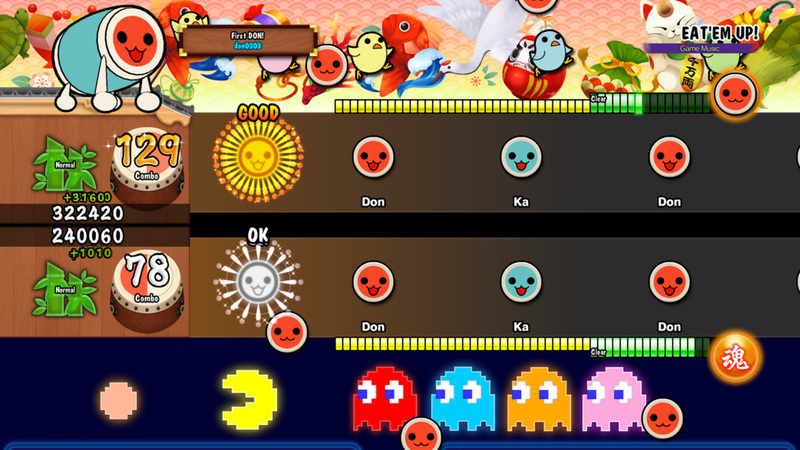 In 2001, Taiko no Tatsujin drummed up plenty of love when it first showed up in Japanese arcades, and its fandom has only increased over the years. The development team is particularly excited about a new feature that allows players to battle online using “ghost data” collected from players all over the world. The fact that it uses ghost data, rather than online matches, is an interesting way to sidestep potential connectivity and match-making issues. Some songs have guest characters, like Hatsune Miku, and Pac-Man. You also earn tokens while you play, which can be used to get character customization items, sound effects, and greetings. Taiko no Tatsujin: Drum Session will feature iconic songs from Neon Genesis Evangelion, Disney movies like Frozen and Zootopia, and tracks from Kemono Friends, Hatsune Miku, and even Touhou Project games. Some of the team’s favorite Tekken, Tales of Berseria, Ridge Racer, and [email protected] tracks are also included. Lastly, there will songs from Attack on Titan, Dragon Ball, and One Piece. In short, there’s a lot for fans to be excited about. Many gamers are still crossing their fingers for a signature drum controller to go with it. We can only hope one appears!